About a year ago, I found myself on the set of a late night television show on the same afternoon as a taping by the California group, Edward Sharpe and the Magnetic Zeros. At the time I didn’t take the band so seriously. 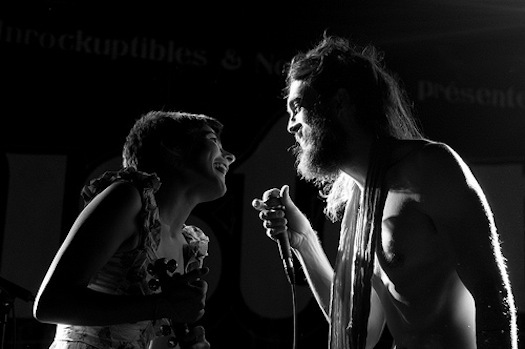 Their leader, Edward Sharpe aka Alex Ebert, was formerly the lead singer of a not-so-serious band called Ima Robot. They were from Los Angeles, a city filled with not-so-serious bands, or at least bands I didn’t generally take that seriously (except maybe for the state’s more extreme punk bands). Worst of all, he seemed to be taking inspiration directly from a trend called freak-folk which, a few years after the trend has passed, kind of doesn’t require a long, drawn out explanation anymore. Anyhoo, times have changed. I’ve come to realize the power of The Song to overwhelm sense, taste, aesthetics, reason. That’s one of their songs.